The recent anti-Muslim violence in Kandy was a wake-up call about communal tensions that lie beneath the surface in our society, which make it susceptible to abuse by powerful forces with political motivations. In a manner reminiscent of the prelude to the almost three decade long war against the Tamil separatist movement, there’s a sentiment being promoted amongst the Sinhalese ethnic majority that the Muslim minority is a source of threat to its security. 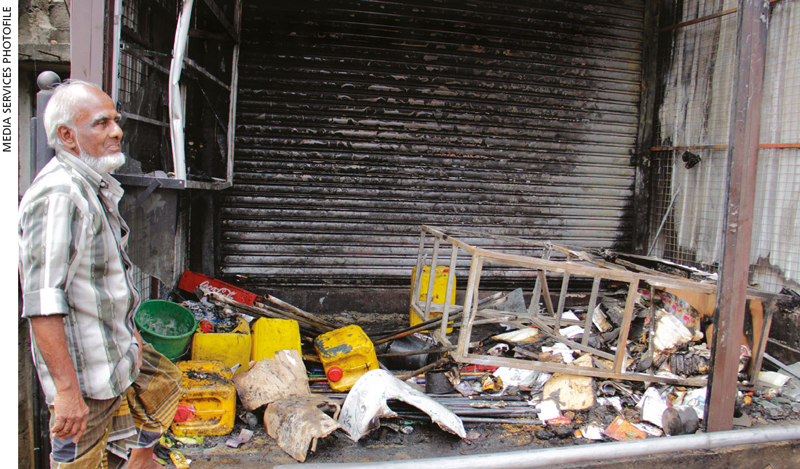 The violence directed at Muslim owned shops, mosques and vehicles in Ampara was a continuation of a process of fuelling tension, suspicion and hatred between communities. Anti-Muslim propaganda focusses on the growth of the Muslim population and its expansion into areas inhabited primarily by members of other communities. Some of those who foment violence against the Muslim community have cast unfounded allegations about the introduction of birth control drugs in food packets meant for public consumption. The targeting of Muslims for hate speech has become especially marked after the end of the war in May 2009. There was a serious anti-Muslim riot in Aluthgama in 2014 that claimed four lives, and destroyed Muslim owned businesses and houses. This was accompanied by a vicious campaign on social media that portrayed Muslims as plotting to take control of the country with the help of global Islam. A tragic feature of Sri Lankan history has been the exploitation of fears by politicians eager to win the votes of the ethnic majority as an easy route to gaining political power. The newly formed Sri Lanka Podujana Peramuna (SLPP), which trounced government parties at the recent local government polls, made fears about division of the country and a danger of foreign intervention a main plank of its election campaign. Former President Mahinda Rajapaksa appealed for calm at the time anti-Muslim violence was rising. This was welcome but he simultaneously used the opportunity to blame the government for seeking to divide the country through constitutional reform. This was a case of appealing for calm on the one hand and rousing nationalist fears on the other. During the riots, Prime Minister Ranil Wickremesinghe spoke about economic and social setbacks to the country. A few days earlier, he was in Singapore promoting Sri Lanka as a paradise and canvassing foreign investment. Those hopes would have gone up along with the smoke of burning Muslim shops and other properties. Hopefully, the eyes of the general public will be opened to national priorities, as well as the connection between communal harmony and economic development. Without trust in one another, no family or country can succeed. Wherever they live as a minority, which is in most parts of the country, Muslims will now feel a greater sense of insecurity and vulnerability. It would not be unreasonable for them to feel that if they’re attacked in Kandy, which is Sri Lanka’s second most important urban centre, they could be attacked anywhere. Both the government and civil society must prioritise restoring the confidence of the Muslim community that Sri Lanka is their home as much as it is the home of other communities. Over the past few years, there has been a deliberate and purposive building up of tension for political reasons. This has to be undone by enlightened leaders in government. In the longer term, there is a need for trust building, and community awareness programmes to be conceived and implemented. The government has a duty to reassure the Muslim people that they’re equally deserving of the protection of the state and will in fact receive it. Leaders of government must come out and talk to the people, and reassure them. Government leaders must act and speak publicly, and take the people with them. Civil society has its own role to play by educating people. Having only just emerged from a prolonged civil war, Sri Lankans are now being pushed into a new conflict – unless the Sri Lankan polity as a whole and civil society in particular make the promotion of inter community interaction and understanding a central pillar of everything they do. Until the national political leadership takes firm and determined action, there is an increasing likelihood of Sri Lanka facing a new cycle of communal violence. Sri Lanka remains in a postwar phase where the wounds and traumas of the past three decades of violence and war have not been healed. This is the message from Ampara and Kandy, which the government and civil society must take more powerfully to the people. The message given by the incidents in Kandy and other areas is clear. Politicians are behind these activities. The government, NGOs and intellectuals especially Muslim leaders such as ulama should take leading roles to not repeat the incidents again. All political parties in their policy statements and propaganda set policy decisions not to encourage racial politics. Their aim should be uniting our nation. Racist parties shouldn’t be allowed to participate in politics. Muslim or any other racial parties with their communal agenda should not be allowed or should be wiped out. Muslim racial parties until recently only paid attention to the east and north. Now, for their own personal political ends, they extended their political activities to Kandy and other Sinhala dominated districts. Their political activities destroyed Muslim-Sinhala coexistence. And it contributed to the unrest in these areas. Muslims have to be in the national parties and Muslim racial parties should not participate in politics in these areas if they want to do good for them.